There are many different types of travel bags available in the market, each designed for a specific purpose. The reality is that each type–roller bags, daypacks, duffel bags, carry-on, backpacks–serves a different type of traveler better than others. The key is finding the bag that fits your needs. Apart from all this, not all backpacks are equal. There are travel backpacks designed specifically for traveling. Sometimes people confuse hiking backpacks with travel backpacks. Now you’re probably asking what’s the difference? It’s in their intended use and thus their design and features. For instance a travel back will have specific features gear towards traveling and likewise hiking backpacks will be built for hitting the trails. This doesn’t mean you can use the same backpack across both activities, as most models are extremly versitile, but you’ll want to focus on getting a bag desinged for what you’ll primarily use it for. If you’re just here for a quick answer of which are our favorite travel backpacks, take a look at our top picks. 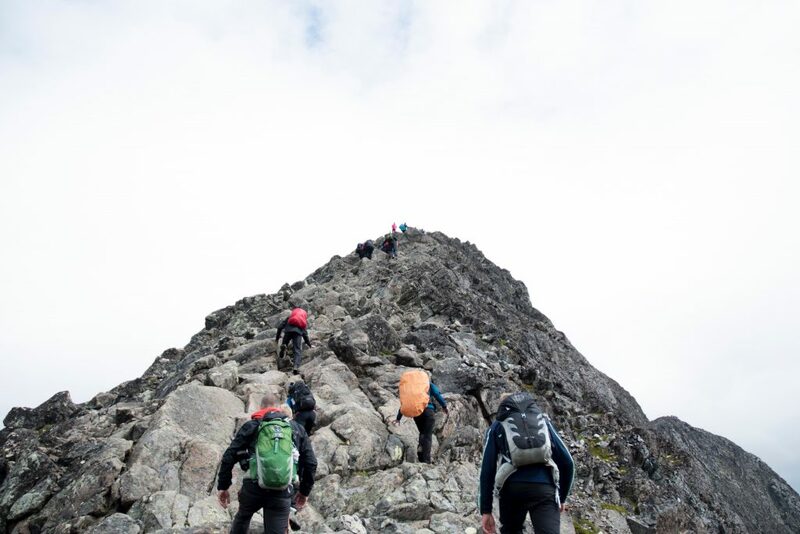 Hiking backpacks are designed for hiking or trekking which is normally a few days long or sometimes a single day trip, whereas travel backpacks are used for traveling which may last for months, not to mention across multiple countries. 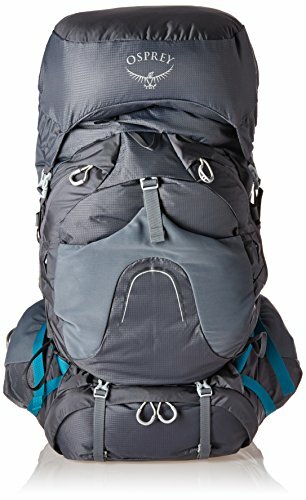 The difference in use between hiking backpacks and travel backpacks is their design. Hiking backpacks are lighter and generally compact. On the other hand, travel backpacks are generally built tougher, able to carry more stuff, have panel loading. These along with other differences can make your life a lot easier and less stressful when traveling, say for example easier access to clothes and gear in the middle of a bus terminal minutes before your departure. Travel backpacks have various features, each with its own purpose and role. These features together decide what kind of backpack you get. This quick guide will help you understand these features so that you can decide which style bag fits your needs the best. Suspension System. Comfort is one of the most important features in any backpack and especially a travel backpack. To carry weight for long periods of time, you’ll thank yourself for a super comfortable backpack that is easy on your body. Most bags use a combination of suspension and straps to distribute pressure. Padding on the straps and pressure areas also make it more comfortable. A good suspension system means the bags are comfortable to carry with least stress on your body. Hip Belt. The Hip belt is another comfort feature. It makes sure the backpack is securely intact and the weight is equally divided between the upper and the lower body. Number of Compartments. The more the compartments in a backpack, the easier it is to manage your stuff. Some people may prefer fewer but larger compartments whereas some may want lots of small compartments. It basically depends on your usage and preference. Top vs Side Opening. Backpacks generally have two types of openings: top opening and side opening (also known as panel loading). Top opening backpacks only open from the top while the side opening backpacks can open from the top up to the sides of the bag. I’ve found that the ideal type for traveling is the side opening since you won’t have to unpack everything when you want an item located near the bottom. Zippers. The number and quality of zippers also matter. Although is not a very important feature as compared to others but good quality zippers and design can make or break your trip. You don’t want your zipper busting halfway through your trip. Material & Build. High-quality material and construction are essential for any backpack to survive global adventures and long-term travel. Ultimately the materials used and build of the pack determines the durability and toughness of your backpack. A back with a tough material can last years and pays off in the long term. This is where paying a little more pays back dividends years down the road. If you’re buying a pack for travel and you’ll be using it day-after-day you’ll thank yourself for spending a little more on a good product. Now let’s take a look at some of the Pros and Cons travel backpacks may have. They are ideal for traveling as they are designed for it. They have enough space/compartments to carry all your important gear and allow you to access it easily. They have good comfort features which make them great for traveling and carrying around. Travel backpacks have better security mechanisms than hiking backpacks. Easy access, you don’t want to have to unpack your ENTIRE bag to retrieve something from the bottom. They are generally heavier and larger in size (thicker straps = durability, etc). 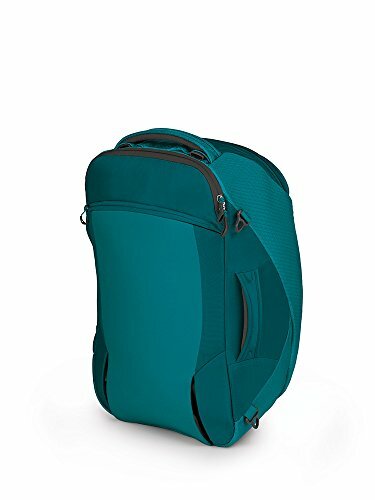 Some travel backpacks do not have enough small pockets to carry items like water bottles. Most travel backpacks are not convertible or packable hence they lose out on portability. Considering all these things, I’ve compiled some of the best travel backpacks available on the market. The best travel backpack for you may be different for your buddy. This is because of the difference in style, compartments, features, and even brands to consider, including Osprey, The North Face, Patagonia, and many more. But one thing is for sure, you need to choose your backpack depending on the type of travel you want to do. Do you need the best lightweight travel backpack for a day trip, or do you need one that can store enough gear for a week in the woods? Once you’ve figured that out, the decision on which backpack to buy will be much easier to make. 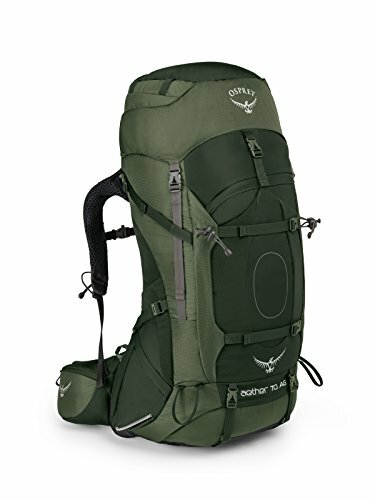 If you’re looking for the best backpack for travel, you can’t go wrong with the Osprey Aether 70. It is large and roomy, with a huge main compartment, a bottom sleeping bag compartment, a removable lid that doubles as a daypack, a few mesh pockets, and two zippered ones on the hipbelt for easy access. There is a large J-zip on the front of the bag to give you full access to the contents. Compression straps cinch it tight when it’s fully loaded. Loops and straps are added for additional storage. There is also anti-gravity technology in the suspension, backpanel and harnesses to give you full control and easy carrying. The hipbelt and sternum strap work with the suspension system to even out your load and reduce strain on your body. On the sternum strap you will find a whistle in case you find yourself in an emergency situation. 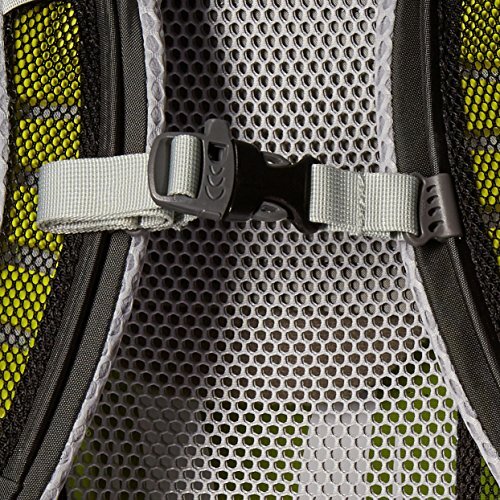 Mesh on the backpanel and padded adjustable straps help cool you down, even on those long hikes. And inside is a hydration sleeve to keep you hydrated on your trip. 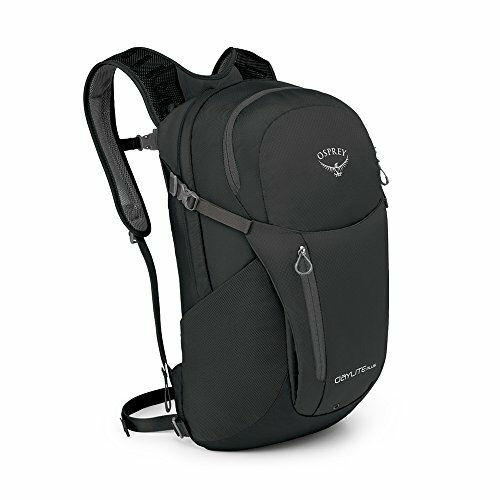 The Osprey Aether is available in the sizes 67 L, 73 L or 76 L and there are 3 colors to choose from. 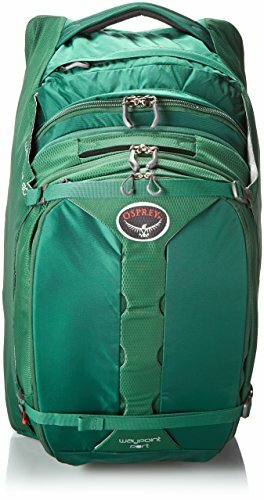 Yet another bag by Osprey, but this is one of the few backpacks that lie in the legal carry-on size category. Although it seems on the smaller side, it’s still spacious enough to carry enough for a long-term trip. 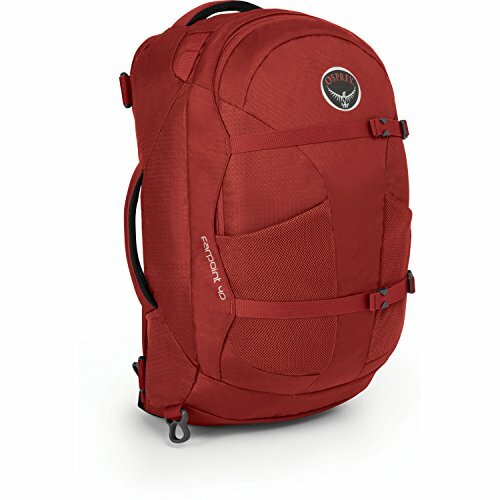 Lightweight and affordable it’s a great choice for any traveler looking for a high-quality and durable pack without breaking the bank. With the lower price and lighter weight you give up some bells and whistles, such as less suspension and no daypack. But there are still some great features, such as the straitjacket compression straps that keeps all your gear compact and safe. These also allow you to cinch the bag small when you aren’t using it. There are also a number of pockets, including a lockable laptop/tablet sleeve on the outside. The main compartment is also lockable for added security. And if you need a bit more room, there are a couple of reinforced cord loops that can be used to attach a smaller Osprey Daypack, though this little pack will need to be purchased separately. 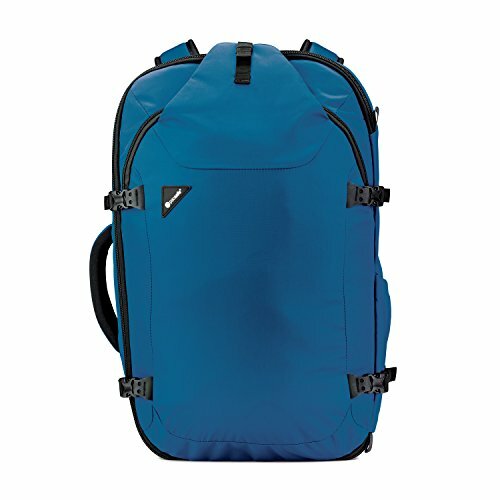 This one falls in the category of smaller travel backpacks, although it also includes a 15 L capacity daypack. 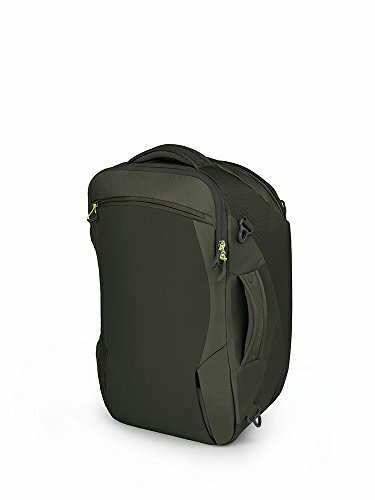 It is designed for comfort and convenience, and overall is a simple travel backpack that can do it all and survive abuse thrown at it day in and day out. Osprey is one of the most reliable and dependable brands when it comes to backpacks, plus they have a lifetime guarantee and will replace your pack if anything ever breaks (for free!). That is a huge bonus and I’ve had to use it once before when the frame broke in my Osprey Atmos 50. One drawback on the Farpoint 55 is its stiff, large frame which can be cumbersome at times compared to other travel backpacks. But the mesh on the backpanel, harness, and hipbelt helps to reduce chafing and extra sweating on those warm days. Plus, the harness and hipbelt are stowable, which is perfect for air travel. There are a number of zippered and mesh pockets for all your smaller gear. And the main compartment has a large panel opening, plus lockable sliders on the zipper to keep unwanted hands out of your gear. 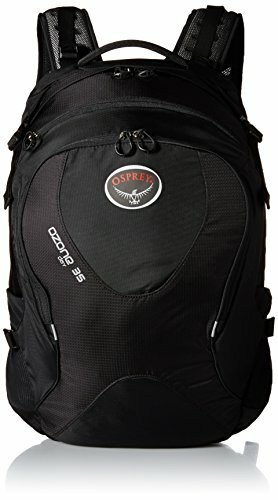 Another great travel backpack by Osprey. You’ll see that Osprey holds a spot for many of the top travel backpacks on the market. The Waypoint 80 Travel Pack falls in the medium to large size category and can easily be used for any global adventure. You can fit all your gear plus whatever you may pick-up along the way during your travel. It has a very good and comfortable suspension and sturdy design that creates a durable backpack you can take with you anywhere, from the jungle to a more modern setting. The Waypoint also includes a detachable daypack, which you can use for short day trips, leaving your larger pack behind. Multiple pockets, including a laptop sleeve inside, let you sort your smaller items, giving everything its own place so it is easier to find. And the large panel opening makes packing or searching for that one item in your backpack a breeze. I also love that this pack doesn’t have any loose straps when secured, so you don’t have to worry about it getting caught or damaged when you check it on flights. And the compression straps cinch everything down tight, giving you a smaller bag to carry when it’s not completely full. 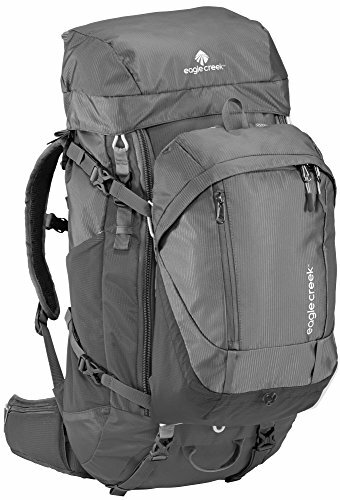 The Eagle Creek Deviate Travel Pack is almost the perfect size for long-term backpacking. I find that 50L is at times too small and having just a bit more space sometimes would be ideal. 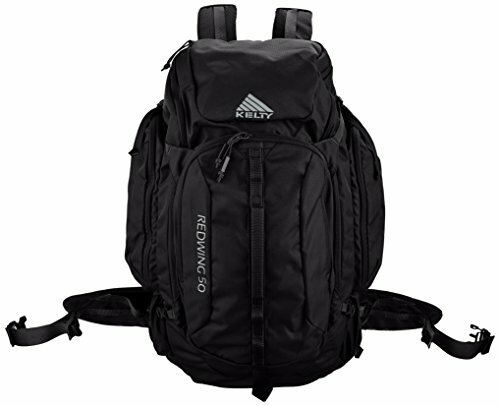 This backpack for traveling is lightweight and durable with a capacity of 45 L with a 15 L daypack. 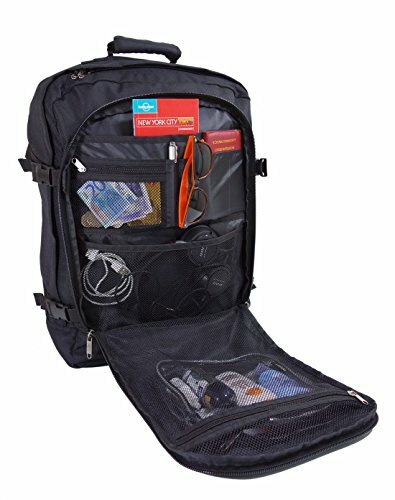 Good suspension, features, and durable design make this a serious competitor for the best travel backpack title. Plus its detachable 15L daypack can come in handy when exploring new cities or taking a short hike. 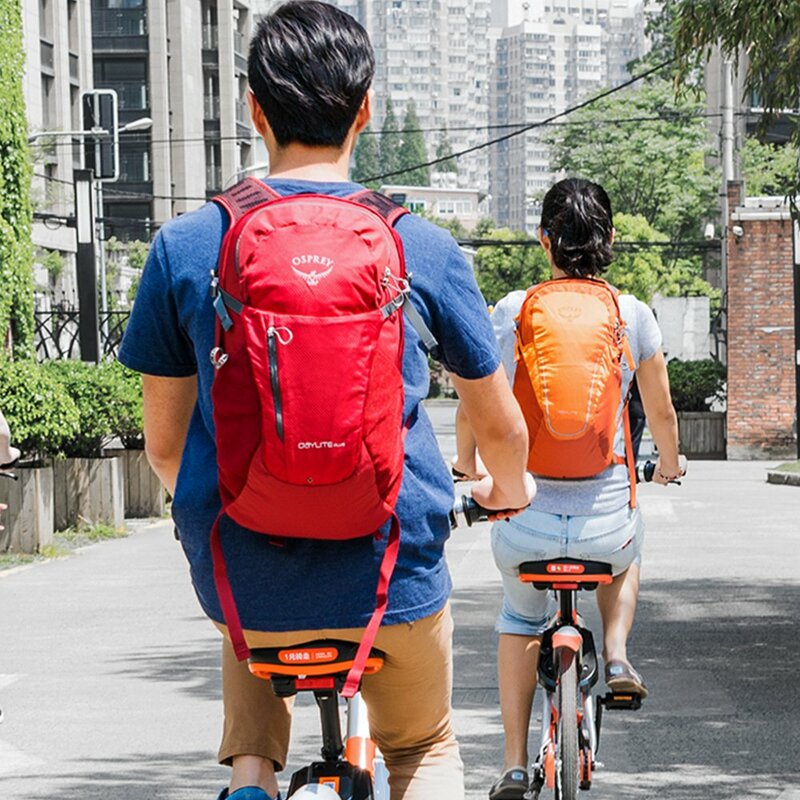 These little travel backpacks have a bunch of great features, like mesh padded backpanels, shoulder straps, and hipbelts, all which are moisture-wicking capabilities to keep you cool and dry. All that back material is stowable, which turns your backpack into a lockable duffel but also doubles as a rain cover in damp weather. There are lockable zippers on the hood and main areas, plus there are a few handy pockets for all your gear. This even includes a hydration bladder sleeve that comes with an elastic loop right on the shoulder strap for the hose/straw. And external compression straps cinch everything down for a smaller bag to carry. The Deuter Transit is another handy traveling backpack that adds a small daypack to the larger backpack. The larger addition is about 38 L, and the little one zippers on to the outside of the backpack to add another 12 L of space. On the big one is an adjustable VariQuick system that lets you set the backpanel to the perfect length for your back. There is also a flexible X-Frame with ergonomically shaped hip fins which form to your shape and transfer the load evenly for added comfort while you walk. And this whole system stows away when you don’t need to carry the pack on your back, turning it into a handy duffel bag. There is a large main compartment with a divider that can turn the bottom area into its own compartment. This makes it easy to separate your stuff, plus gives you dual access to it from the top or bottom zippers. There are also a few pockets found on both the large and small packs to help you organize everything. For security, there are some anchors on the zippers, which allow you to add a TSA-lock when traveling by air. When traveling for business or pleasure, this may be the best travel backpack to meet your needs. 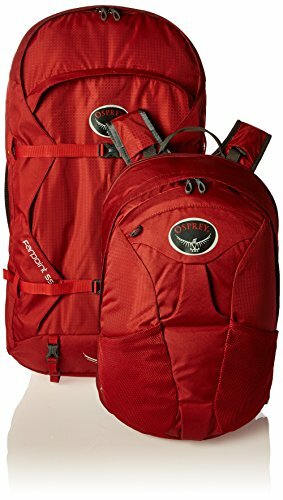 The Kelty Redwing 50 is a very popular small to medium category backpack that is well-rounded and reviewed. Built with a hydration compatible design it can easily crossover as a hiking backpack on your adventures. The Kelty Redwing 50’s suspension provides enough comfort to carry all the load and is built super tough. The PerfectFIT suspension uses a single LightBeam aluminum stay and an HDPE frame sheet. 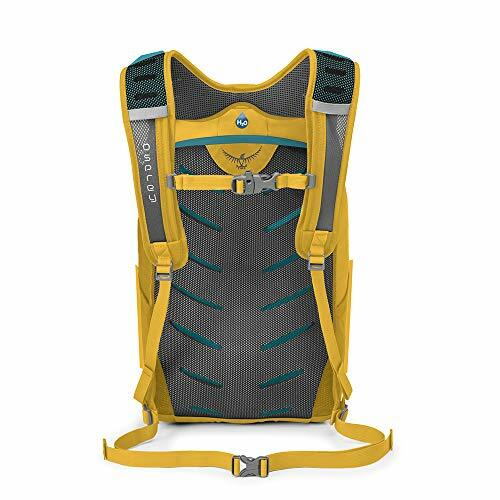 There is also the Hex Mesh back panel, shoulder straps, sternum strap, and removable waist belt, which all work together to keep the load even and reduce strain on your back and shoulders. 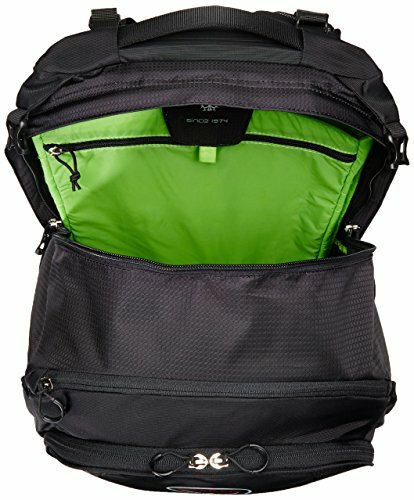 This backpack for traveling has loads of storage space. This includes a variety of pockets on the outside, plus a daisy chain and some extra loops for ice axes and trekking poles. A handy sleeve inside can be used for laptops on business trips or a hydration sleeve when out in the wilderness. 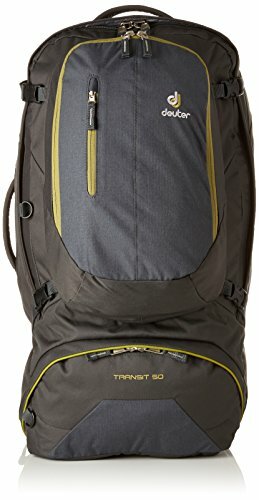 Another benefit that may just make this the best travel backpack is the low price that will likely fit into any budget. And it comes in four great colors that will suit members of both sexes. The bottom line is that its a great pack for long journeys. 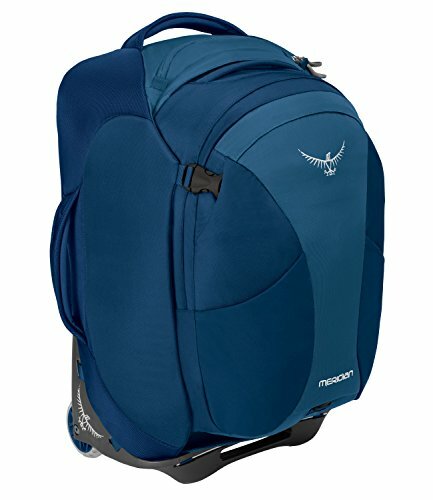 There is already a newer version available of the Kelty Redwing 50 Backpack. Weight: 3 lbs 11 oz. Carry on backpacks are like other travel backpacks, but with a few specific differences. They are small enough to meet airline carry on regulations. They also have a few features for security, like lockable zippers and pockets. And they have areas designated for documents, wallets, and other items you need easy access to during your flight. Another thing that makes these the best travel backpack for flying is that they are pretty stylish. They can be matched to your other luggage if needed or can stand alone for shorter trips. Plus, you can use them for daily use, so you don’t need an array of travel backpacks taking up space in your closet. If you need a great carry on, the Tortuga Outbreaker is one of the best travel backpack models around. It has a huge amount of storage for pretty much anything you need, with a variety of pockets and sleeves to keep it all organized. The inside opens up like a suitcase, with a compartment big enough to hold all the clothes you’ll need for a week. 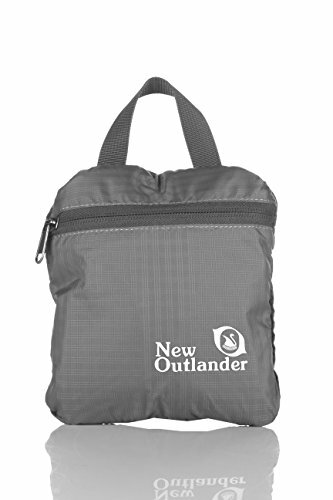 There are a couple of mesh zippered pockets on the lid to hold your smaller items as well. There is another large zippered compartment with a padded tablet sleeve on one side and a few more mesh pockets for cords, plugs, earphones, and other necessary accessories. Then, on the outside of the bag, is yet another flap, with organizational pockets for pens, cards, and even a notebook. A few more zippered and slip pockets are located around the outside of the bag for all the rest of your items. This carry on travel backpack is durable, with X-Pac waterproof sailcloth to keep your gear safe and dry. There is soft padding on the back, and a height-adjustable suspension so you can find the right fit for your height. The coated zippers are lockable as well to keep all your stuff safe. 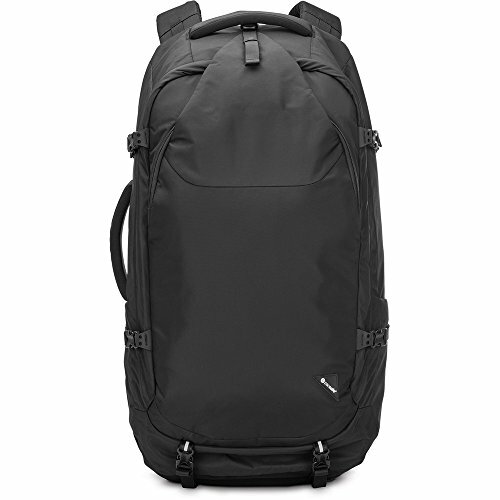 There is also a smaller 35 L bag available if you prefer to travel a bit lighter. 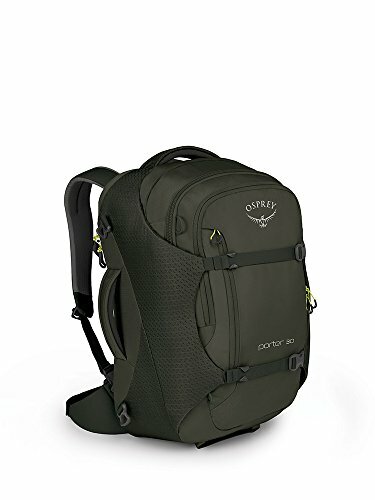 The Osprey Porter 30 is another great small backpack for travel. Its sturdy nylon material can handle some busy trips with a bit of rough handling. The sidewalls are padded as well, to protect your gear as well. The backpanel is foam, to increase comfort while you’re strolling through the airport. And when it comes time to stow your bag, the backpack straps, hipbelt, and sternum strap can all be stowed away under a handy zippered flap, leaving the padded top and side carry handles open for easy lifting. There is also plenty of storage, so you won’t have to leave your important essentials behind. Inside is a large main compartment, with a couple of side pockets for your smaller items. On the outside, there is a top pocket for toiletries, a front panel pocket for documents, magazines, or books, and a zippered back pocket for a laptop or tablet. The main area and the back pocket are both lockable as well, to keep your most important items safe. Other features include a few D-rings for adding a shoulder strap, StraightJacket compression which uses padded wings and a lower panel to keep all your clothing safe and secure, and a few extra reinforced loops for adding a daypack if needed. Though the Cabin Max Metz doesn’t come with all the bells and whistles found on some other carry on backpacks for travel, it still has everything you need for a great trip. The one thing it can boast is the huge volume of colors and patterns to choose from. There are a total of 55 different options, including solid colors, outdoor scenes, and a variety of patterns, like feathers, dots, and even emojis. The large panel opening for the main compartment gives you easy access to your gear when packing, unpacking, or searching for that one elusive item. There is also a large panel pocket on the front of the bag to keep your documents and other necessities organized. A smaller zippered pocket on the front is best for those little items you want easy access to. There are outer compression straps to cinch down the size of the bag to fit it nicely under a seat or in an overhead bin. The backpack straps are padded for extra comfort, plus adjustable for the perfect fit. And the polyester material is showerproof, so you won’t have to worry about soaked clothing if you’re out in the rain. If you need a simple, lightweight bag for your next trip, the Metz may be the best travel backpack for you. 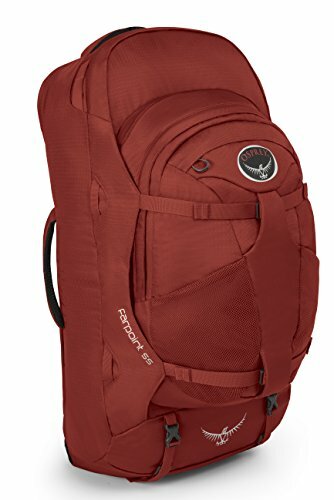 The Osprey Farpoint 40 is lightweight and easy to carry with you for a weekend away from home. The durable nylon material houses a Lightwire frame suspension, which spreads the load evenly over the backpanel, straps, and padded hipbelt. But all of this back material also tucks away neatly behind a zippered flap to keep it safe when the pack isn’t on your back. Inside is 40 L of space to store your all the clothing you’ll need for your trip. An inner compression system holds it all in place for less shifting. There is also a mesh pocket in there for your smaller essentials. A laptop sleeve is also located inside, to keep your more expensive items secure. This area has lockable sliders on the zippers to keep thieves out of your bag. On the outside of this travel carry on backpack are a few more pockets and more compression straps to make your bag even smaller, which is essential when trying to meet those strict airline size requirements. 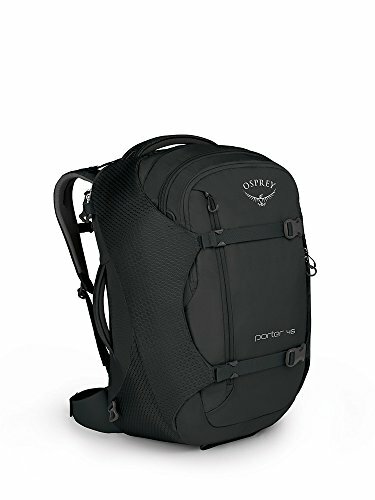 This backpack for air travel comes in two colors If you think the Farpoint 40 will be a bit large for your needs, there is also a smaller 38 L model available. 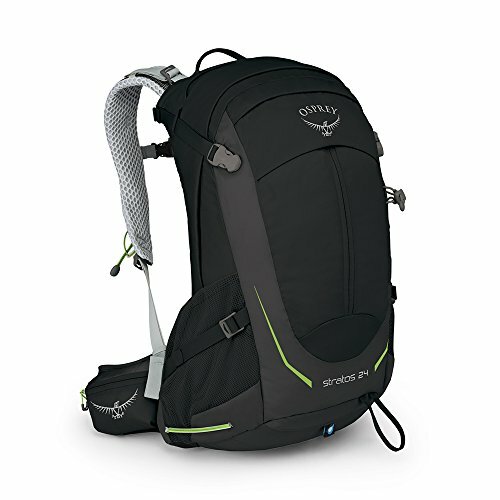 The Osprey Ozone 35 has a simple design that’s easy to use and carry, no matter how long your wait for your flight is. It uses sturdy and durable nylon material for the bag itself, which reduces punctures and tears. The backpanel is mesh for some extra ventilation, with a light padding on the shoulders and hipbelt to reduce the weight while increasing the comfort. There is a large opening at the top of the bag for easy access to the main compartment. This gives you plenty of space to pack your clothing, plus makes it easy to reach your laptop or tablet stored inside in the scratch-free sleeve. There are a couple of mesh pockets on the side for water bottles, snacks, or other items you need quick access to when traveling. There is also an organizational pocket on the front, which has another hidden pocket inside for those little items you want to keep extra secure. There are dual compression straps near the top and bottom of the bag to cinch it smaller when fully packed. Another handy feature not found on any of the other bags we’ve reviewed is the Ozone Handle-It, which lets you attach this travel backpack to the handles of your wheeled luggage. You may think a backpack is a backpack, which is true in many cases. But while one backpack may fit nicely on one person, it may not feel quite right on another, especially if this other person has a slimmer build. This is why many of the best travel backpack brands are now offering women’s models. These women’s backpacks are slimmer in design, not just in the backpack itself, but in the backpanel and the straps. This gives the women in the group a pack that sits properly on her shoulders, with thinner straps instead of bulky ones that may rub on the neck or fall off the sides. 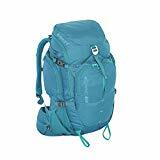 These packs also tend to be a bit lighter to carry, without sacrificing too much in the way of capacity. And they still have all the great features found on men’s or unisex packs. The Osprey Aura AG 65 is a great pack for all types of travel situations. 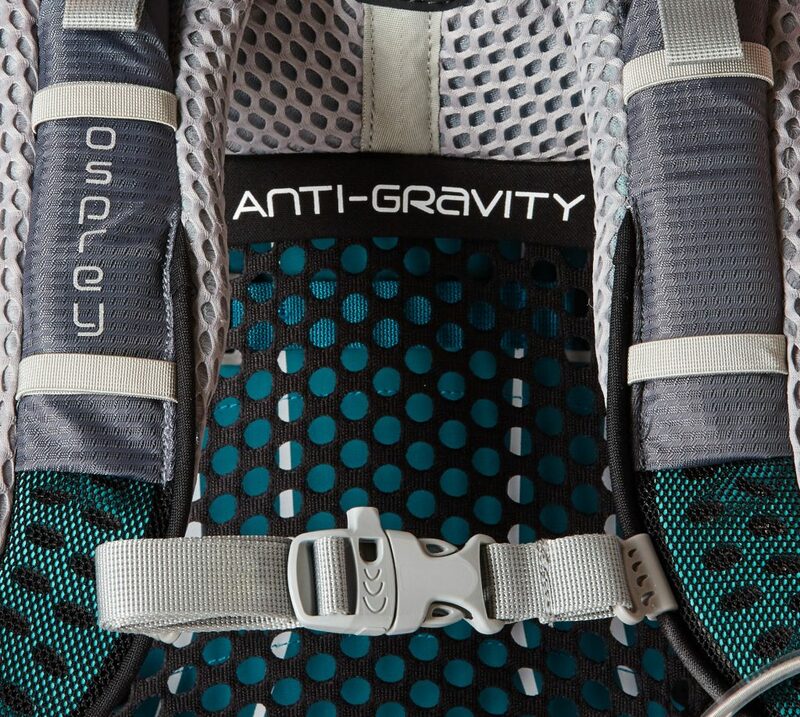 It uses an anti-gravity suspension, which includes a continuous backpanel that goes from the top of the pack down to the hipbelt. This panel is made of mesh for increased ventilation, plus curves around the body for a more comfortable wear. The shoulder straps and hipbelt are both padded mesh for better transfer and more comfort while you walk. For organization, there are a number of outer pockets to sort your gear. The inner compartment is huge as well, with a divider that separates it near the bottom to give you a separate sleeping bag compartment if needed. There are loops and straps to attach trekking poles, ice tools, and sleeping pads as well, so you won’t have to leave any important gear behind. Another handy feature is the floating top lid, which has a few extra pockets and attachment points. This lid is removable, but these travel backpacks for women have added an integrated FlapJacket to protect the gear in the bag when the lid is off. The Aura has also added an internal hydration reservoir sleeve, which can hold up to a 3 L reservoir to keep you hydrated on your trip. There is a safety whistle on the sternum strap for emergencies. The Kelty Redwing 40 has a number of great features that make it one of the best travel backpack options for women. The design is one of its top features, mainly because of the women’s specific suspension. The shoulder straps and the hipbelt are all made to fit the contours of a women’s body, aligning with her curves for a more comfortable fit. 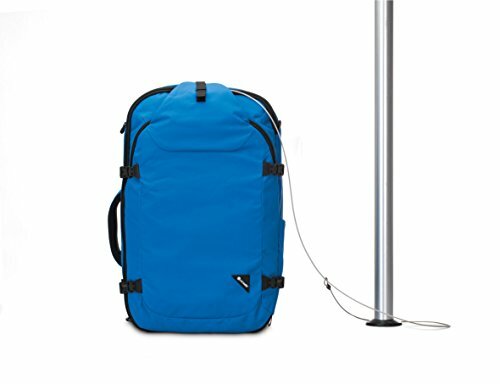 This traveling backpack is lightweight, with a decent capacity that holds what you need for a few days away from home. 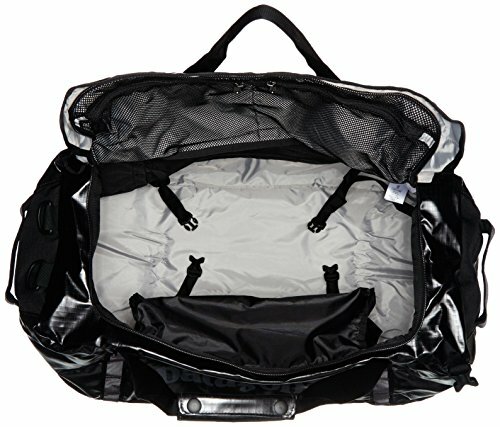 There is a Hybrid-loading U-zipper that can be used to top load your pack, or opens up wide for a panel style opening. There are multiple pockets on the outside, including an organizational one to sort your pens, electronics, documents, and all your other smaller gear. Inside the bag is a laptop sleeve, which can also double as a hydration sleeve for a reservoir when some extra water is needed. And compression straps on the side let you shrink your bag down after you’ve packed everything you need. Other handy features include the removable waist strap, Hide-Away daisy chain, some loops for tools or poles, and a key fob to keep those within reach. And for those on a budget, this stylish backpack has a decent price. A wheeled backpack combines the easy use of a backpack with the convenience of a wheeled suitcase. The wheels are great for pulling around your pack and saving your shoulders and back some strain when you’re doing a lot of foot travel. There are also the straps to hoist the bag up onto your shoulders when needed, which will happen more than you think. The addition of the wheels makes these packs a bit heavier though, so you do have that to contend with. But the fact that they have the same space and organizational capacity as a normal backpack, plus can give your back a break now and then, makes the extra weight well worth it. If you’re looking for the best rolling backpack for travel to Europe or anywhere else in the world, you can’t go wrong with the Sojourn 45. It has a deployable backpack suspension, which includes the peripheral frame, the nylon backpanel, and the padded harness. When you aren’t carrying this pack on your back, you can zip all this gear away and pull it along with the dual tube extended handle. The suspension is also removable, which is great for those times when you need a bit of extra room to pack your gear. And speaking of packing, there is a huge panel opening on the front of the bag, which reveals the huge storage area inside. There are also four handy zippered pockets in there to sort your gear as you see fit. And internal winged compression straps hold everything in place. On the outside are a top liquids pocket, more compression straps, and a daisy chain to hook extra gear. On the bottom is the extra wide Highroad chassis, which uses huge wheels to keep your gear high off the ground. 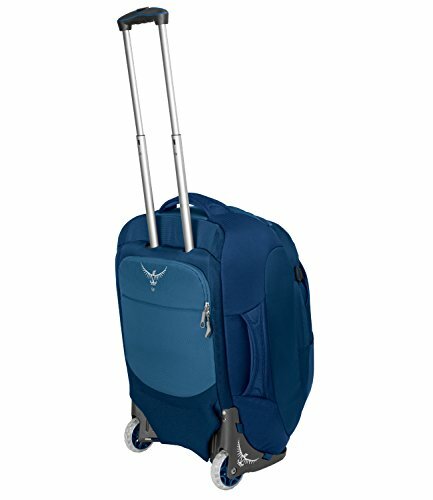 This wheeled backpack from Osprey has a number of great features to make any trip easier on you. First, there is the deployable shoulder harness, which can be tucked into the back panel pocket when you aren’t using it. Then when you need it, pull it out and buckle it in place in only seconds. The Meridian 60 uses a Highroad chassis, which means large wheels and high clearance, so you can pull your pack over almost all types of terrain without scratching up the bottom of the backpack or getting hung up. There is a huge amount of storage space on this pack as well. The inner compartment opens with a wide zippered panel. There are also 4 zippered pockets in there, plus some compression straps to keep your clothing from shifting, no matter how you carry this bag. On top you will find another pocket and that rear panel for other items. The removable daypack even has a padded laptop/tablet sleeve. Lockable sliders on the main compartment give you a bit of security when traveling abroad or closer to home. Best of all, this pack is carry on size, so you won’t need to check it during most flights. 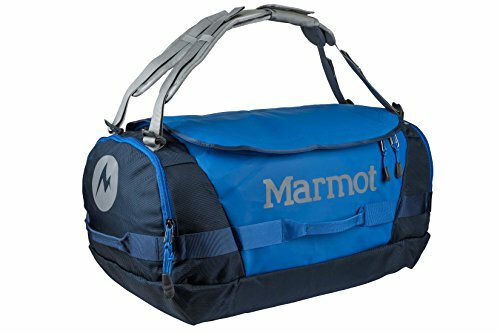 Duffel bags have huge capacities inside, plus have the option of carry handles and shoulder straps. But a backpack duffel gives you a third option, by adding some backpack straps on the bottom of the bag to tote it around on your back for a more even load. There isn’t any technical suspension system, saving room for gear instead of taking up extra space with frames and thick harnesses, but they still offer decent support and keep your hands free during your travels. 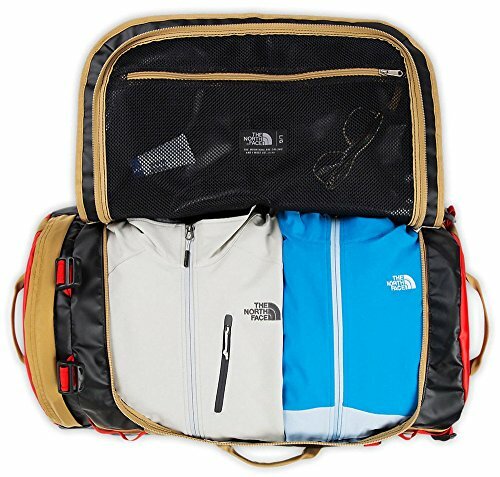 The North Face Base Camp comes in three sizes. The small bag has a 50 L capacity, the medium holds up to 71 L, and the large model has a huge 95 L worth of space to hold everything you’ll need for an extended trip. And each of them comes in a wide variety of colors to choose from. The Base Camp bags use sturdy materials that can hold up to a great deal of rough use. There is double stitching on the seams to keep them from letting go. And the water-resistant coating keeps your gear dry in damp weather. The ID pocket is also water-resistant, so your info won’t wash away if your bag is misplaced. As well as the huge main compartment, there is an inner mesh pocket, plus an end cap for extra storage space. As well as the padded side handles and the lightly padded shoulder strap, there are some adjustable alpine-cut backpack straps included, which you can attach when needed or pack away in a pocket when they aren’t. 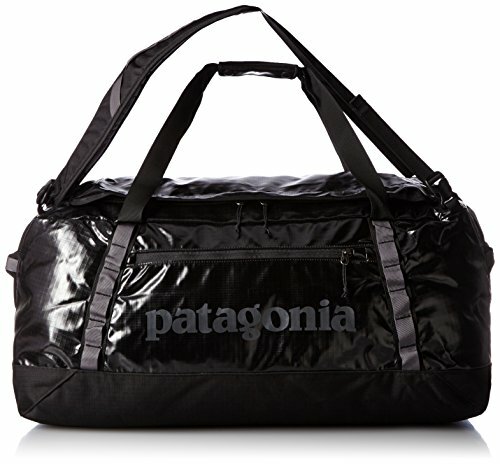 There are a few reasons why the Patagonia Black Hole Duffel is one of the best travel backpack models out there. First, it comes in four sizes, 45 L, 60 L, 90 L, and 120 L.
This gives you four options to choose from, depending on the length of your trip and how much gear you need to take with you. And all of them have a huge main compartment and a few extra pockets for all your gear. The material is 15 oz 900D polyester ripstop, which is strong on its own. But it has a TPU-film laminate plus a DWR finish for extra protection from dirt and moisture. The base of the bag is padded, which protects your gear from any hard surfaces, plus adds a bit of comfort when you carry it on your back. As for carrying it, there are padded backpack straps that can be attached or removed as needed. The carry handles are reinforced to hold up under heavy loads. And there is a padded shoulder strap as well. 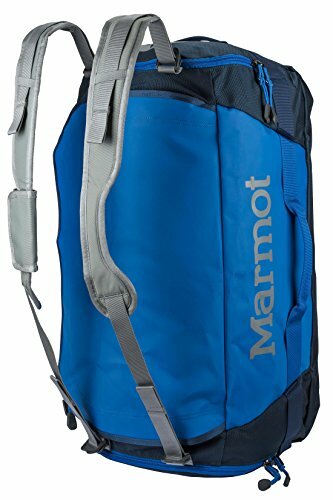 Like the above model, the Marmot Long Hauler comes in 4 convenient sizes, including 38 L, 50 L, 75 L, and 110 L.
They all have similar features, except the smallest in the bunch lacks the side haul handles found on the other three larger models. 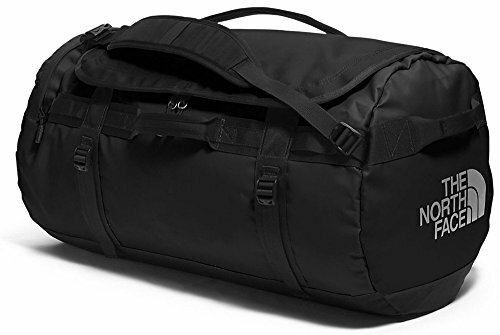 These travel duffel backpacks are made of durable polyester with a nylon lining and ballistic nylon reinforcements to increase the longevity of the bag. This makes them extra tough in pretty much any situation. 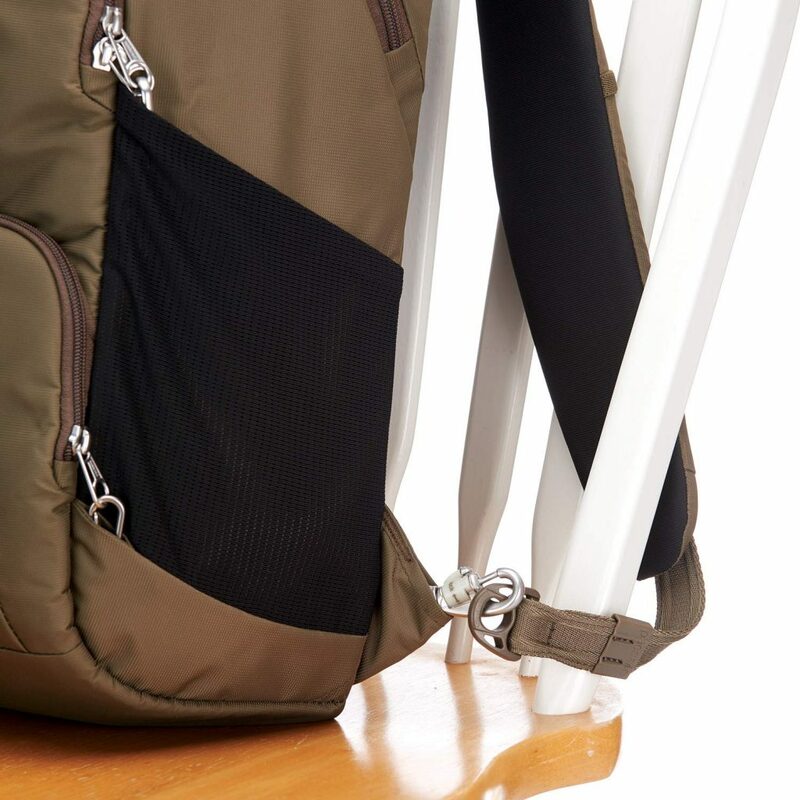 The backpack straps are removable, as with other duffel backpacks, but these ones have the added convenience of doubling as carry handles when attached to the top of the bag. This means you don’t have extra handles and straps dangling down and getting in the way. The large D-shaped opening of the main compartment has a rain flap you can secure over it to keep any moisture out when traveling in the rain. Compression straps help you cinch your bag down when you don’t have it packed full. There are a few pockets inside the roomy main compartment, plus one on an end to keep certain items close at hand. 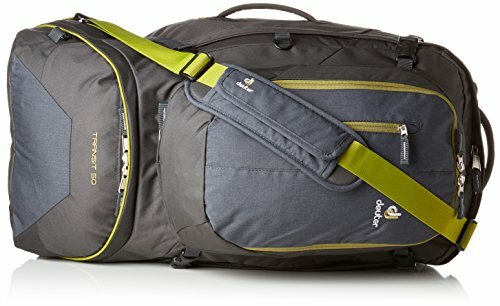 Though this one is the cheapest on our list, its features may just make it the best travel backpack duffel available. 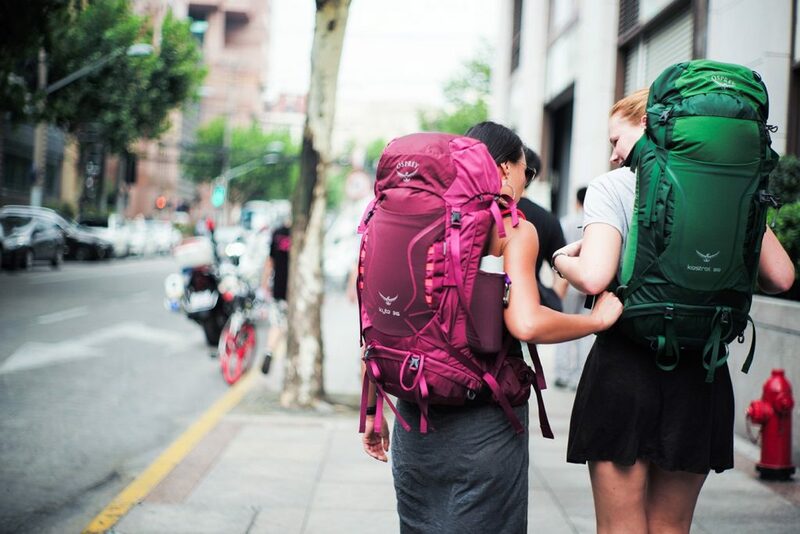 Like most models, it has a few sizes to choose from, which are 45L, 60L, and 90L bags. But even the biggest of the bunch is super light for easy carrying. 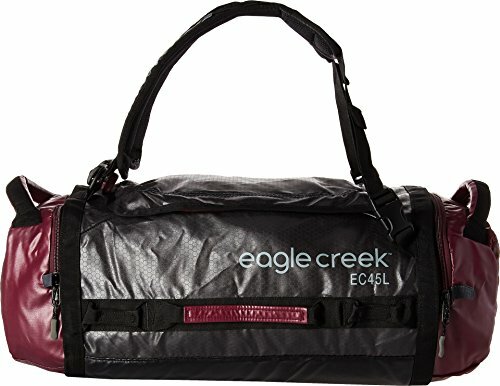 Eagle Creek uses Bi-Tech Armor Lite fabric for these bags, which is water-repellent and resists abrasions without adding to the weight of the bag. There is also Bartack reinforcements on every one of the stress points for even more durability, even during the roughest trips. The bottom of the bag is padded with foam to add some extra protection if you should drop your bag. And a storm flap covers the main zipper to keep your gear dry. There are haul handles on the top and six lash points on the sides, so you can carry these bags any way you like. The shoulder straps are removable, so you can tuck them away in one of the end pockets until you need them. There are also a few safety features added. One is the lockable zippers on the main compartment to keep thieves out of your bag. The material is also reflective, so it will show up better in dark areas with only a little light. Anti-theft backpacks look similar to other backpacks, but they have a few security features added. These usually include lockable zippers that are puncture-proof to keep anyone from prying their way into them. There are also steel cables inserted into the shoulder straps to keep thieves from cutting them and pulling the bag right off your back. Steel mesh in the body of the bag, usually embedded in the bottom and the sides, prevents anyone from slashing through the material and grabbing whatever spills out. These types of backpacks are best used in more urban settings, especially when traveling abroad. 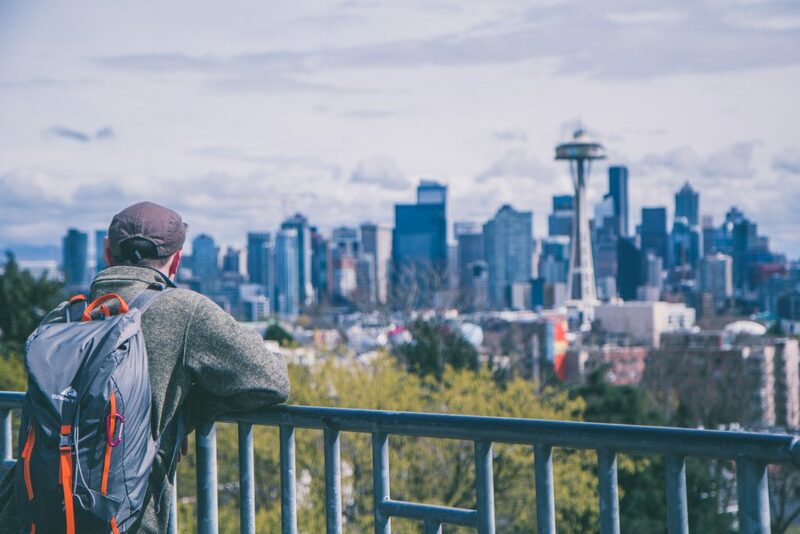 Many cities have an abundance of thieves who prey on tourists, so having one of these types of bags can keep all your electronics, important documents, and other gear safe while you visit the local landmarks. 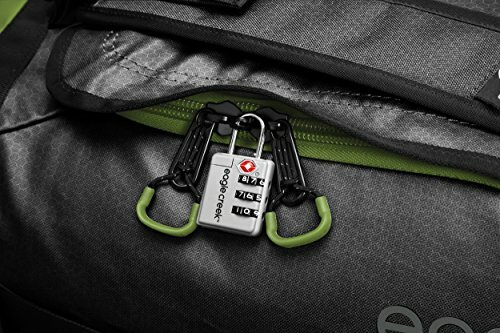 This backpack is designed for maximum security on a longer trip. Don’t worry about your personal belongings, just go and enjoy travelling the world. All of the zippers on the main area and the pockets are lockable in one place, so you only need to get one lock to keep unwanted hands out of your bag. And the zippers are all puncture-resistant, so no one will be able to pry their way into them. There is a reinforced anchor strap so you can secure your bag to a pole or chair. But not only is this one of the best travel backpack models in terms of security, it is comfortable to wear as well. The backpanel is molded foam, with some air channels for ventilation. The shoulder straps are padded and adjustable, with a sternum strap for extra support. With the adjustable, padded hip belt you won’t feel the weight of your pack as much becuase of its weight distribution. A handy feature is also that the shoulder straps and hip belt can be zipped away if not needed during transport. The PacSafe Venturesafe EXP65 has enough main compartment space to carry all your gear. An internal compression strap keeps everything in place and internal pockets help to organize your stuff. It may feel bulky and heavy at times and the pockets may seem difficult to access due to the extra security features, but if you want to ensure you belonging are as safe a possible this is a pack to consider. Weight: 6 lbs 3.3 oz. Though this anti-theft bag is carry on size, it still could be the best travel backpack for a variety of adventures. The security features include the lockable zippers, which all lock in one spot for extra convenience, plus are puncture-resistant for extra security. Slashproof mesh is embedded in the body of the bag and there’s a locking cable to attach your bag to any pole when it isn’t on your back. But this carry on backpack is more than just its security features. It has a book-style opening to the main compartment, with inner compression straps to hold all your clothing in place during your trip. There is also another front compartment, with inner pockets for organization and a sleeve big enough to hold a laptop or tablet. The shoulder straps are adjustable and padded, plus there is a hipbelt and a sternum strap to balance out the weight a bit better. And all that back material can be stowed under a zippered flap when you aren’t using it. Travel day packs are smaller than other types of backpacks because they are not meant to hold more than a day’s worth of gear. They are great for short trips around the city or for an afternoon hike closer to home. Because they are so small, the capacity and features are a bit less than with a hiking or carry on backpack. But they are also lighter in weight, making them easy to carry for a few hours if needed, provided you don’t stuff them with heavy gear. If you need a lightweight backpack for day travel, you can’t go wrong with the Osprey Daylite Plus. It weighs only a pound but is made of durable materials designed for long-lasting comfort. The frame is made of foam but has a center stiffener to help balance the load without restricting movement. There is mesh on the backpanel and on the shoulder straps to keep you cool. The hipbelt helps to stabilize the load, plus is removable when you don’t need the extra support. There is also a sternum strap, which has a handy safety whistle on if for emergencies. 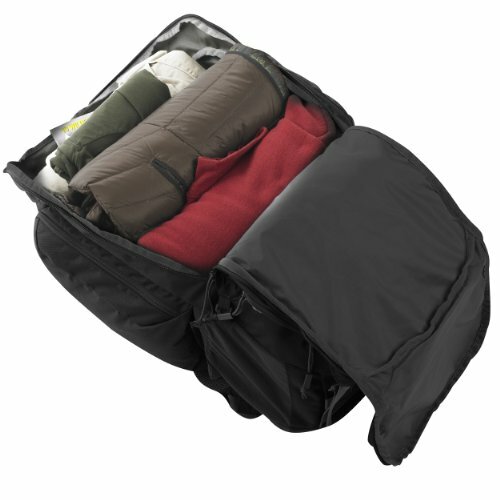 The main compartment has a large opening for easy packing, and there is a padded sleeve inside for a laptop or tablet. There is another smaller front compartment with some organizational pockets inside. A few other pockets on the front and side of this bag give you even more space for your smaller electronics and water bottles. If you need a decent travel day backpack, the Stratos 24 is a great option for any kindof light trip. It has 24 L of space, giving you enough room for a change of clothing, a few books or magazines, and plenty of snacks for an afternoon hike. And there are numerous pockets to sort this gear into, as well as the main area which has an internal sleeve for a hydration reservoir to keep you well hydrated. There is a sturdy alloy frame which helps hold the shape of the bag while distributing the weight evenly. The backpanel is adjustable to fit almost any torso length. The hipbelt is padded, plus has a few easy access pockets. There is even a sternum strap for extra support, which has a whistle incorporated in for emergency situations. Since you never know when the weather will turn damp, there is a removable rain cover added to keep your gear dry while it rains and stored when the sun comes back out. 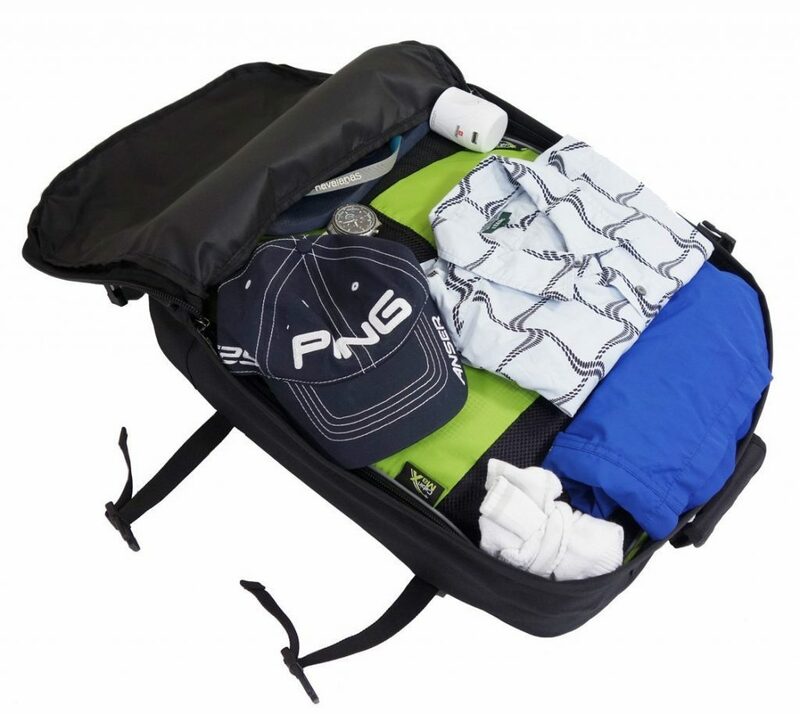 Outer compression straps reduce the size of your bag when space is limited. 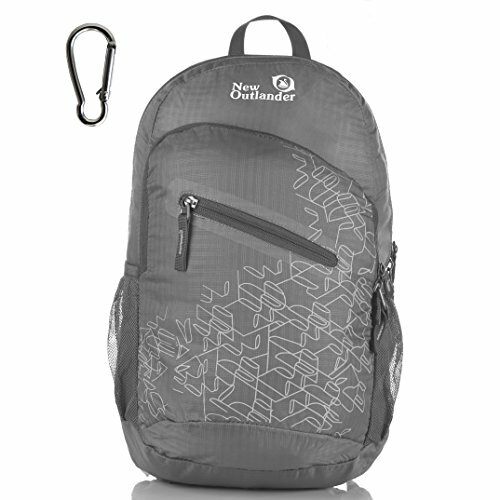 The Outlander Packable daypack has a very simple design that will appeal to the minimalist in the group. 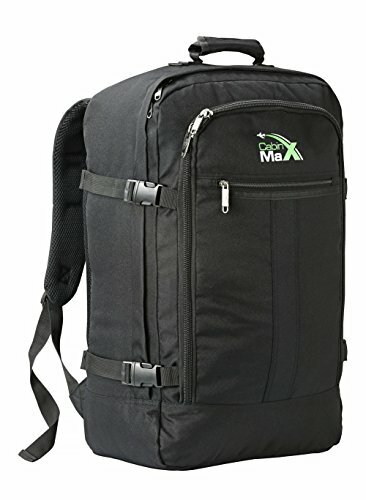 It doesn’t have a lot of extra features like some other backpack out there, but what it does have makes it one of the best travel backpack models around for those who like to travel as light as possible. 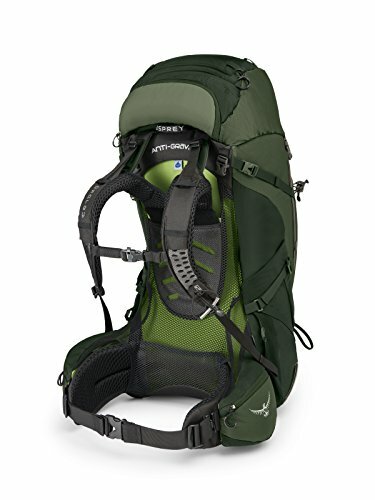 First, this pack weighs less than half a pound but still has a 20 L capacity. The material is rip resistant nylon, which also repels water to keep your gear dry. There are breathable straps on this backpack, which can be adjusted as needed. Bartack reinforcements are on all the main stress points to increase the bags durability. 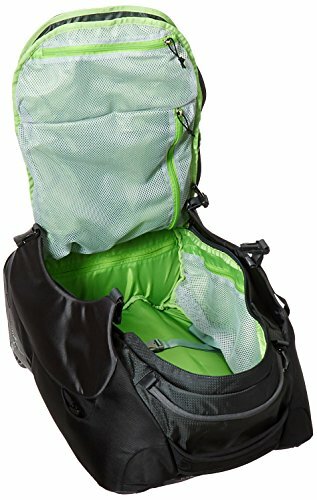 There are two zippered pockets on the front and two pockets on the side with security loops to keep bottles and other gear from slipping out if you bend over. There is also an inner security pocket which doubles as a stuff sack when you aren’t using the bag. This creates a tiny package that you can tuck in your other luggage, put in a glove compartment, or even carry in a pocket until you need your backpack. When you’re packing for a trip, the type of backpack you need depends on where that trip will take you. For instance, a hiker likely won’t need organizational pockets or laptop sleeves, but those traveling for business would. And some people like to pack for any occurrence, while others prefer to travel as light as possible. 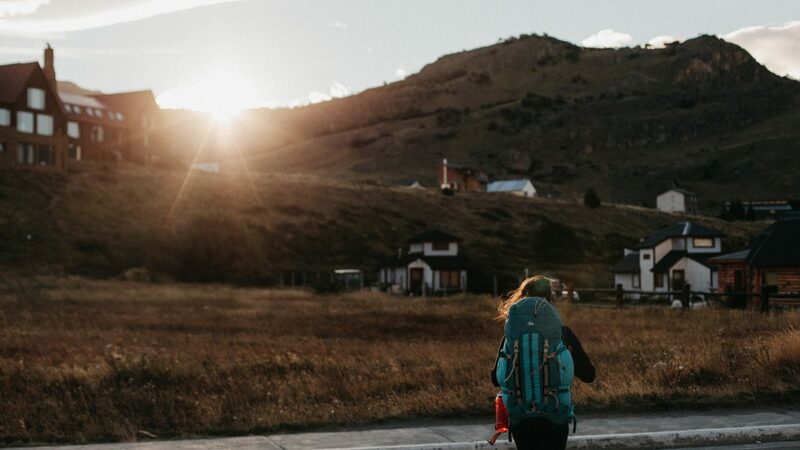 So, before you even consider heading out to by any type of pack, you need to figure out what type of traveler you are and where you’ll use your backpack the most. Then you’ll be able to decide which one is the best travel backpack to meet those needs. There are a number of reasons to travel with a backpack, but the most important one is convenience. The best travel backpack will come in a few different sizes, giving you as much or as little room as you need. There are a bunch of great features, like organizational pockets, attachment loops, and comfortable straps, just to name a few. There are also a wide variety of backpack types to choose from, making them a great choice for any trip. The same can be said for suitcases, but they lack one thing a backpack can offer: hands-free travel. With a suitcase, you’ll have at least one hand on it most of the time. With a backpack, you just slip on the straps, and your hands are free to eat, sort documents, or take pictures of some gorgeous scenery. Here are some things to look for and consider when selecting the best travel backpack. 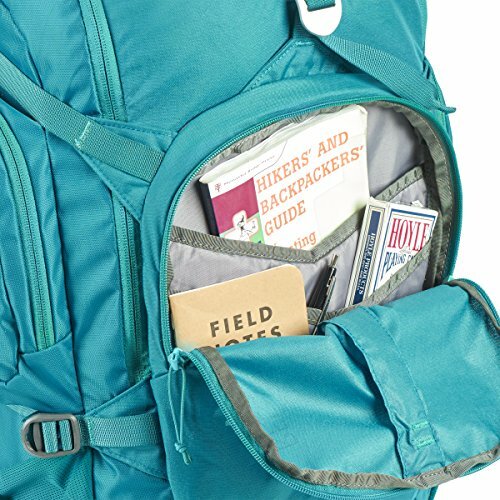 Before you buy your next backpack, you need to first look at the different types of packs available so you know which one you need. There are a number to choose from, including hiking backpacks, daypacks, carry on backpacks, and anti-theft backpacks. They aren’t really one size fits all either. For instance, you won’t need all the security features on an anti-theft backpack if you’re spending a few days hiking. And you can’t use a daypack for a week-long vacation. So, it’s best to figure out what type will be the best travel backpack for the trips you plan on taking to ensure you get the right one. Storage volume is one of the more important things about travel backpacks. You don’t want to get one that’s too small or you’ll have to sacrifice some gear. Luckily, most of the best travel backpack brands offer a few sizes to choose from, depending on the type of pack. You can find small backpacks with low capacities for day or weekend trips. Then there are the huge ones, ranging over 100 L to give you more than enough room for a week-long trip into the wild. Pick the size you need, and remember, it’s better to have a bit of extra space than not enough. Unless you have limited space, the dimensions of the bag are not really that big of a deal. The exception is air travel, where you’ll need to stay within the size restrictions for carry on travel. But for daily use, the dimensions of the bag shouldn’t be a big concern as long as it fits you comfortably. Weight, on the other hand, is something to look at, no matter what type of backpack your buying. The heavier it is, the more weight you’ll have on your back when it’s packed. And if you’re hiking or touring a new city, you don’t want to strain your back or you’ll be ending your trip far too early. So, keep it as light as possible. If your backpack isn’t comfortable to wear, you aren’t going to want to use it. That’s why the best travel backpack models out there have added certain features to increase the comfort, making it easier to wear your pack for long periods of time. These include padded backpanels, shoulder straps, and hipbelts. The straps should also be adjustable to tighten your bag properly so it isn’t shifting around on your back, or chafing will be the result. Ventilation in these areas is also a must, to keep you cool and dry, even on warmer days. Adjustable frames can be found on some of the best travel backpack brands, to fit properly on any torso length. When it comes to the best travel backpack, you can have as few or as many pockets as you need. Some of them have one or two external pockets for easy access to a few smaller items. Some have larger front panels with organizational areas for those traveling for work or school. There are water bottle pockets, security pockets, and padded sleeves for laptops, tablets, or hydration reservoirs. Other handy features found on some of the best travel backpack models are compression straps, inside and outside, depending on the pack. There are loops for ice tools and trekking poles, daisy chains, and straps to attach sleeping pads, though these are usually found on the outdoor models. Check out all the features before you buy the pack, to ensure that it has the ones you’ll need. Because they are used quite a bit more than a normal suitcase, the best travel backpack brands are made of durable materials that will last through some rough handling. This is usually nylon, though polyester is also popular. But material alone doesn’t ensure a quality backpack. That’s why reinforcements on the stitching and stress points are also a must. Zippers should also be high-quality, with YKK-grade being the best. If all of these bases are covered, you should have a good pack that will last for quite a while. Though a packable backpack won’t have such features, most travel backpacks have a sturdy frame, which has a few benefits. The frame helps hold the bag’s shape at the back, keeping it upright instead of forming to what’s inside of it. A decent frame also balances out the load, transferring over the whole pack to make it easier and more comfortable to carry. Frames and other supportive materials should be made of decent materials, like aluminum or some other sturdy metal. They should be able to withstand the weight of the bag without folding in or snapping in half. Otherwise, your backpack won’t last very long. If you want the best travel backpack, you should get one that protects your gear from moisture. Water resistant is good if you’ll only be dealing with some light rain. But for trips that have you spending most of your time outside, waterproof adds more protection, withstanding heavier rain or spills. Though the material is the first thing you should look at, you may also want to check the seams and zippers. Be sure they will also keep moisture out, or you may have some damp gear on your hands without expecting it. Security features are usually found on anti-theft bags, though some other types may have one or two on them as well. Lockable zippers are the most common, to keep anyone from unzipping your bag and rummaging through it. A locking cable is handy for when you want to put your bag down, to keep thieves from walking away with it. Steel mesh and cables in the body and straps prevent slashing and cutting of the bag. Some type of ID tag is also handy, in case you lose the best travel backpack you’ve ever had, to make sure whoever finds it can also find you. Carry on travel backpacks are great for those who would prefer to carry their gear on their backs and keep it with them instead of checking it. These types of backpacks could be top-loading, but many of them open up like a suitcase to make it easier for security to check your pack. More importantly, the best travel backpack carry on is designed to meet most airline regulations. This means the dimensions and the weight are meant to fit within the guidelines, so you can take your backpack with you right on the plane. This makes air travel much easier, faster, and cheaper since you don’t have to pay for checked bags or wait for them at baggage claim. 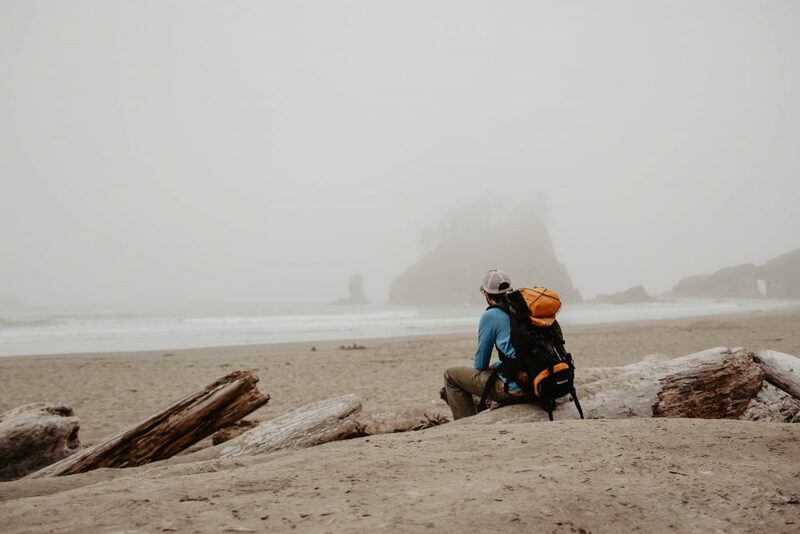 Though women can use unisex or men’s backpacks, there are a few things that make a women’s specific model the best travel backpack for their body type. Since most women are generally shorter than most men, these backpacks are designed to fit the short torso. The shoulder straps are narrower at the top to fit the smaller shoulder width. The base is also a bit slimmer. Hipbelts are also slimmer and shorter, with adjustments to fit the woman wearing it. There is more contouring to fit a natural women’s curves, and the length of the straps are shorter to match the shorter body. Women’s backpacks are generally lighter, with less capacity than men’s models. But they can still hold everything you need, with similar pockets and features found on other backpacks. The style of a backpack depends on the type of backpack you’re using. For instance, a big hiking backpack is designed for lightweight durability rather than looking good. This doesn’t mean such outdoor backpacks can’t still be stylish, it just isn’t the focus. Daypacks and other smaller travel backpacks do usually have a bit of style to them since you’ll likely use them in a more modern setting, so you’ll want them to look good. But no matter what kind you pick, there will usually be a few attractive colors to choose from. Some brands offer more than others, adding some interesting patterns into the mix, but this won’t be found on all types of backpacks, so don’t expect it from every brand. Of course, with so many different types and brands of backpacks out there, you shouldn’t have any trouble finding one to meet your personal style. The best travel backpack should come with a decent warranty. Most brands offer warranties that cover defects in the manufacturing or workmanship of the bag. This is great since you shouldn’t be punished for some type of error in the product before you even purchase it. This type of warranty could be for a few years after purchase, but some go for the entire life of the product. There are even some brands that offer repairs for other issues with no charge, or replacement if repairs can’t be done. But this isn’t the case on every type of backpack, so be sure to check out the warranty info before you shell out any money. A travel backpack’s value is more than just its price. The materials used, the compartments and pockets, the anti-theft additions, and the backpanel and harnesses, all show the value of the bag. The more there is, the more the manufacturer spends to put in there, so the higher the price will be. Of course, there are some smaller brands who still put a lot into their bags without adding the high price. With some companies you are also paying for the brand name as well as the product, so keep that in mind when searching for the best travel backpack for your next trip. When it comes to travel backpacks, there are so many different types and brands to choose from. They vary in style and use, so you will be able to find the right kind for any type of trip you plan on taking. But which one is the best travel backpack in each of our categories? Well, I’ll give you my top pick, and you can decide for yourself if it’s the best one for you. 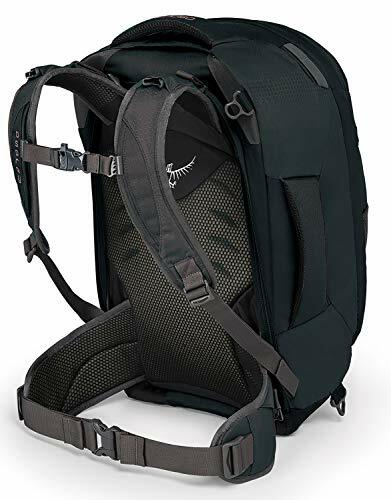 For the large travel backpacks, the Osprey Aether AG 70 is a great choice, due to the wide opening, bottom compartment, removable lid/daypack, and those loops and straps for extra gear. 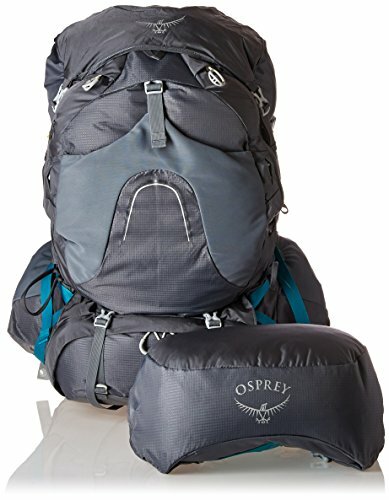 In the carry on travel backpack area, the Osprey Porter 30 and the Osprey Farpoint 40 have similar features. But the Farpoint is bigger and also has a smaller size if needed. Of course, it also comes with a higher price tag, but you may need that extra room. The Kelty Women’s Redwing 40 is the best of its category. It is light, with a great women’s specific suspension, plus has an abundance of storage space inside and out. Though both of our rolling travel bags are great choices, the Osprey Packs Meridian 60 comes with a removable daypack and suspension, plus has lockable sliders for added security. The Eagle Creek Cargo Hauler is the best of the bunch in the duffel backpack category. It comes in a few sizes, has great safety and protective features, and it is the cheapest one of the bunch. Though our two anti-theft options are both great bags, the PacSafe Venturesafe EXP 45 Anti-Theft Carry-on Travel Backpack is a bit less bulky, making it more comfortable to carry. Last, but not least, in our daypack section, the Osprey Stratos 24 comes out on top. It’s a bit bigger and heavier than the other two but has handy features like compression straps and a rain cover that are not found on the other models. You can also read our guides to the best packable sun hats, the best insulated water bottle and other recommended travel products here. First bought the Farpoint 2 years ago for my month backpacking in SE Asia. I love this bag, and the detachable day pack is the best little pack I’ve ever had (though unfortunately too small for my 15″ laptop). I actually use the day pack as my day to day backpack when not traveling or often as my backpack on travels where I bring a different suitcase. The whole pack fits easily as carry-on though you’ll probably have to separate the day pack from it and store that at your feet. And the ability to zip up the straps creates a clean, neat little “duffel” that’s super convenient. Can’t recommend it enough (it’s also much cheaper than you listed even on amazon, ~$180). Thanks for the input! 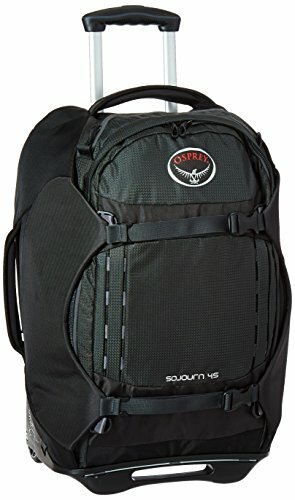 I also love the detachable daypacks on the Osprey backpacks and thanks for pointing out that you can often grab it on sale on Amazon.